One of my main adaptations when I make any baked goods from a USA based recipe I cut the sugar at least in half. For this recipe I used 3/4 cup of sugar and it was easily sweet enough, even with the addition of tart raspberries. According to the original recipe I worked from this recipe is Scandanavian. A great coffee cake for brunch. The cake is very simple, I decided to reduce the workload and not zest the limes, it turned out wonderfully tart anyway. I did add the lime juice called for. Pretty much I did what I could to further simplify the recipe and it was a winner. 1. Preheat the oven to 350°. Butter a 9-inch springform pan and flour. Beat with a mixer the granulated sugar and eggs at high speed until fluffy, 2 minutes. Beat in the melted butter. At low speed, alternately beat in the flour and lime juice until mixed. 2. Pour the batter into the prepared pan and smooth the surface. Gently press in the raspberries and figs. Take small teaspoons of raspberry preserves and drop into batter dotted across the cake. Bake the cake on the bottom third of the oven for 40 minutes. Watch the cake until it is golden and tests with a clean toothpick inserted in middle. 3. Transfer the cake to a rack to cool. Run a thin knife around the edge and release the springform. Dust the cake with confectioners’ sugar. Simple and beautiful. I think if you don’t have fresh figs available other malleable fruits could easily replace them. I used frozen raspberries as fresh were not in season and it turned out great. the addition of the raspberry jam offered just an extra punch of sweet/tart. I agree with Maggy, eggs benedict is a favorite, but it seems like one of those things that you just don’t throw together like a fried egg and toast. I’ve put together an adaptation that can be quick enough for a not too busy morning or a great simple brunch offering. 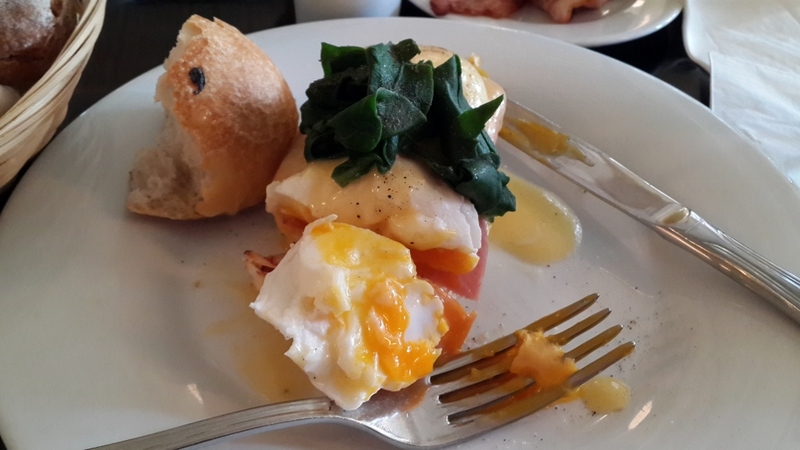 Eggs benedict can be problematic in Israel due to the lack of two traditional ingredients, Canadian bacon and English muffins. To resolve this I actually attempted to make homemade English muffins that turned out like dough hockey pucks. So to look for alternatives I decided on unsliced baguette or unsliced sourdough, a dense enough bread to succeed in the recipe and not absorb the hollandaise like a sponge. 4 Turn off the blender and taste the sauce. It should be buttery, lemony and just lightly salty. If it is not salty or lemony enough, you can add a little lemon juice or salt to taste. If you want a thinner consistency, add a little warm water. Pulse briefly to incorporate the ingredients one more time. Store until needed in a warm spot, like on or next to the stovetop. Use within an hour or so. Poach eggs a la Julia Child or rewatch ‘Julie and Julia’. Bring salted water to a soft bubbly simmer, crack open eggs and put in a small container, slide them into simmery water. As eggs cook in simmering water, gently coddle with slotted spoon until white becomes opaque, cover pan with a lid and spoon out when white just solidifies over the yolk. This will only take a few minutes. Steam some spinach for a dressing, or just use another decorative green, heat the deli meat in microwave, assemble with toasted bread, 1 meat layer and place poached eggs on top. Pour easy hollandaise over and voila! Living in a few different parts of the world, some things just don’t exist in the local cuisine, even if they could. For instance, rhubarb. 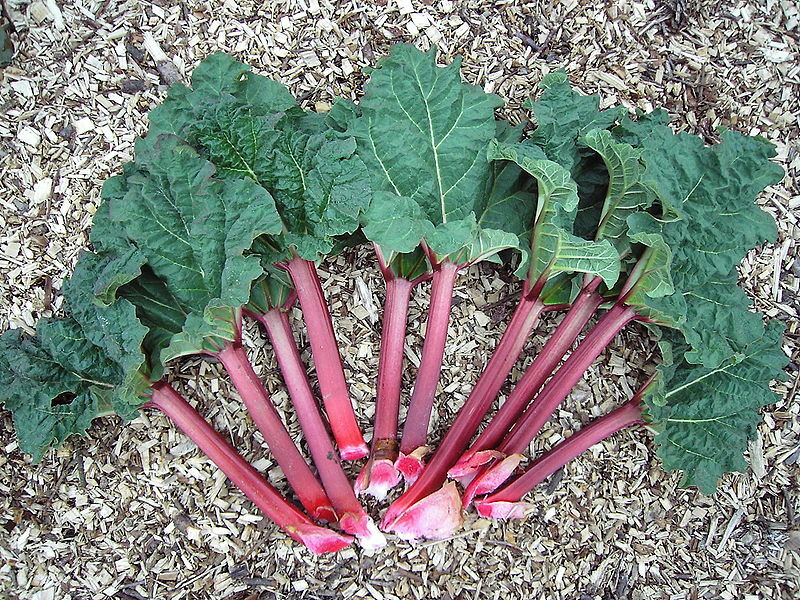 Growing up in north central North America, rhubarb was so plentiful, I remember picking it in the fields nearby with my cousin, taking it home, dipping it sugar and eating it raw. I can’t imagine doing that today! Tastes change in adulthood, like all of a sudden one day you wake up and like bleu cheese and avocados. Rhubarb isn’t very common here in Israel and only appears seasonally and in a few special fruit stores. I still love it, but cooked only! It arrives here in large packages in the fruit markets so I make it at once or two batches. Like celery, it keeps well. 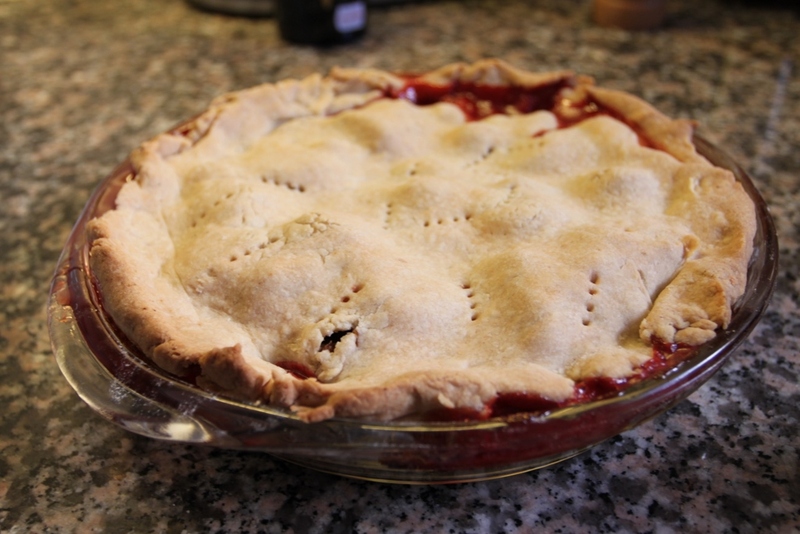 I usually like the flavor combination of rhubarb with strawberries so these two recipes feature both which are available at the same season. For both recipes, I began with a large measuring Pyrex mixing bowl (wish I’d taken photos) and dice up about 5 cups of rhubarb. Add to that about two cups of strawberries, 7 cups total. 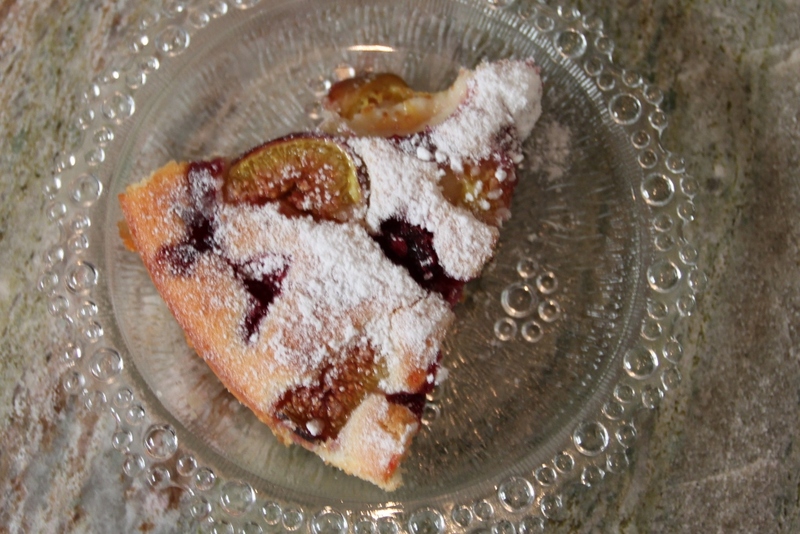 Have a minimum of 5 cups of fruit for a standard pie plate. Add 1 cup of sugar and 1/4 cup cornstarch 1 1/2 tsp. sea salt. Mix all together until all the fruit slices are covered with the dry mix. Take out two cups of the fruit mixture and place in a saucepan with 1 cup of dry red wine and 1 tbsp. of finely minced lemon peel and add cinnamon. heat mixture in saucepan until rhubarb becomes completely softened and mixture is thickened. The wine deepens the flavor and gives a beautiful burgundy color to the compote. Cool in fridge completely before trifle making. In a small microwave-safe bowl, sprinkle the gelatin over 2 tablespoons of water. Let stand until softened, about 5 minutes. Microwave at high power for 5 seconds, just until the gelatin is melted. Whip the whipped cream until stiff peaks form. Mix mascarpone and cream cheese together completely with a mixer. Add dissolved gelatin and water. Whip 1 cup of whipped cream until stiff peaks form. For cream mixture fold the mascarpone and cream cheese mixture in with whipped cream. Your trifle base is ready. Layer in a serving bowl, preferably galss, with cooled rhubarb-strawberry compote. For Crust: I put all the ingredients except ice water in a food processor with main blade. Mixture should turn into a pea-like butter/flour mix. Add ice water slowly. If mix doesn’t hold together gently add tablespoons of ice water until it does. Take out and divide into two balls and roll out one ball for pie crust bottom. Line pie plate. Pour in 5 cups of fruit mix above. Roll out top pie layer and place over fruit crimping all the edges. Pierce the top of the curst to avoid bubbling the crust. I usually add a design, this time was the day’s date, 3/7. Bake at 350/185 c. oven until crust is browned, about an hour. We have had a dream of opening a pizza place of our own in Israel. This is not only inspired by the idea of wanting great simple food and the love of Pizza, but the lack of what we consider, compared to the multiplicity of options in the States, GOOD pizza. Most slices easily grabbed as a single slice in the majority of pizza joints here are either too doughy, too soggy, lacking flavor or not original enough in their toppings. Cheese is more expensive than chicken per kilo in Israel, so a slice or a whole pizza is not a really a cheap meal, most family sized pies with more than one topping being an average of 80 shekels. Pizza has its origin in Napoli, Italy, is a protected dish there that must be made to certain specs in order to be called pizza and has become the world’s most popular food. A few blocks away from the home I grew up in in the States was a real Neopolitan making authentic pizza, and that was it, just a place to pick up, carry-out, hardly a place to sit down (no delivery) and wait for an awesome pie where Dino, a devoted Italian artisan and family man was the only one manning the whole operation. It just was far above the pizza any of the chains were offering and probably ruined me for anything less. 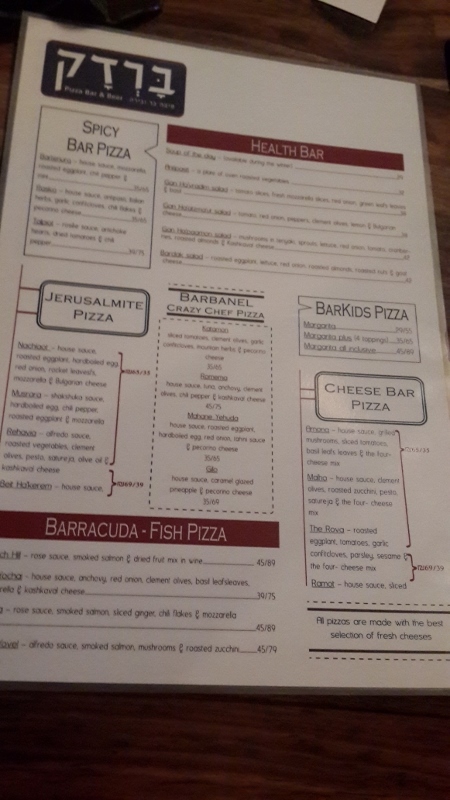 Of course Dino wasn’t making kosher pizzas, another stumbling block to great pizza in Israel, if you want to be kosher the toppings have to be meatless. The concept of pizza in Israel is represented by the many chains where you can order a large pie, pick it up or have it delivered or where you can walk in and pick up a quick slice that is sitting cold under glass. Your cold slice will be heated up for you and you can sit there for a few minutes in a plastic chair and buy a drink from a fridge or run back to the street or your car and fill your stomach. Slices now run about 14-16 shekels. Bardak is relatively new to the restaurant scene here, having opened in 2013 has now amazingly already been ranked #1 on tripadvisor for restaurants in Jerusalem. It is a restaurant, not just a pizza stop. I think they’ve done it, achieved a truly flavorful pizza with their sauces, hand-tossed crust with the right density and texture for local tastes. It is located in Talbiyeh, across from the Inbal hotel at the intersection of Jabotinsky and Keren Hayesod in a building block with several other eateries. They don’t deliver, but you can order on the phone +972-2-5877795 and pick up. They don’t offer a menu you can take home. All the pizzas are hand tossed and the menu is divided up into designer pies named after Jerusalem neighborhoods, and cleverly most have just a little of that neighborhood’s personality in the pizza. 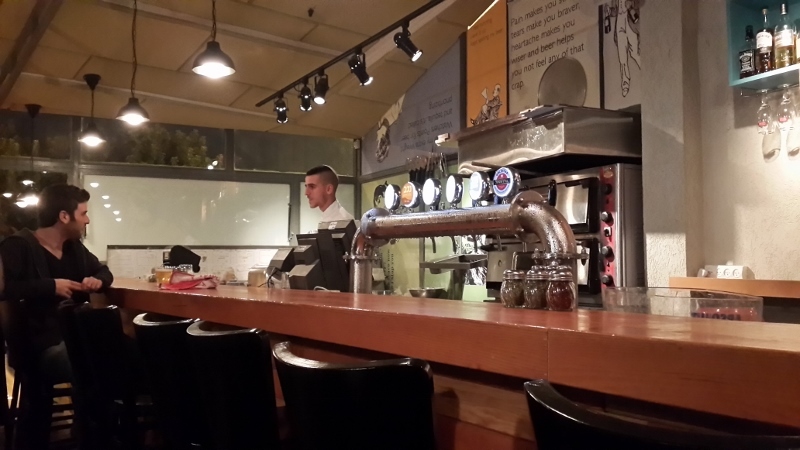 Craft beers made in Israel are on tap as well as many other bottled varieties made right here locally. Sundays offer all you can drink draft beer for 65 shekels per person, not an offer I’d win at but a great value for those who can. The developer has created some surprising flavors and combinations using dried fruits, cumin, shukshuka sauce, kashkoval, tehina, eggplant, along with the more basic requests like mozzarella cheese, mushroom and tomato. The hand-tossed crusts create a great result, not soggy, not too crispy for local tastes and not too doughy. Great sauces are incorporated and they don’t skimp on toppings. The atmosphere is intimate, warm and crowded, with a long wood bar and seating, nostalgic and amusing décor with posters of comics and old city street signs on the east wall. There is a tv for sports fans. Bardak offers mainly table and bar seating and is a pizza place that is a real restaurant, a destination, not a place to grab food and go, even though you can if you want. A photo of the Bardak menu taken with my phone is featured here, not too clear but you get the idea. 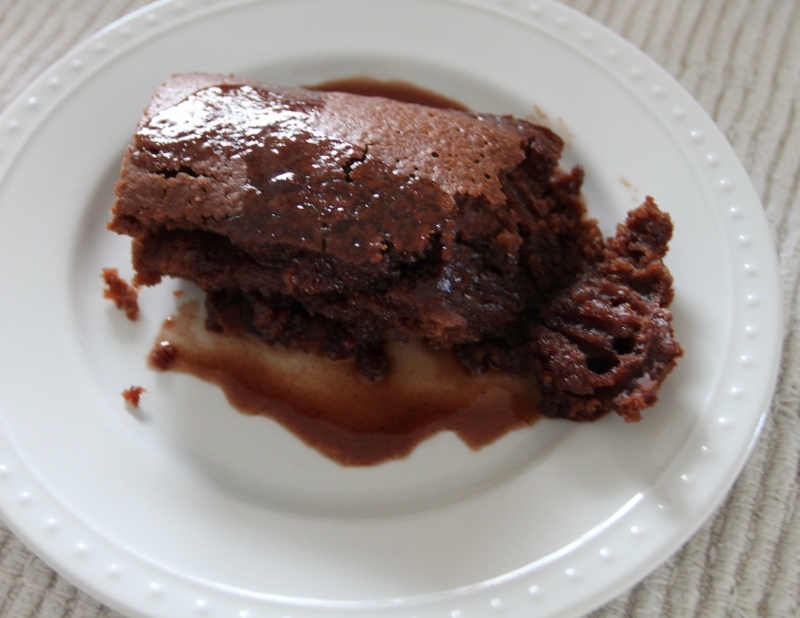 This recipe is my adaptation of a Southern classic, Coca-Cola cake. From my teen and college years until I hit young motherhood I drank one can of Coca-cola per day, it had to be the 12-ounce, non-diet and in the can. Coke is still the only sweetened carbonated beverage I’m tempted to drink, next only to root beer. Fortunately I’ve given up that habit of empty calories. Southern food is definitely known to be high calorie and high fat. Interestingly, its the one area that could really benefit from the healthy Mediterranean diet, with growing seasons, great rain and soil, and an abundance of seafood in the Gulf and the rivers. There were many recipes for this cake on the net, but the one I’ve now made my adaptation is simple, moist and wonderful. Combine dry ingredients in your mixer. Preheat oven to 350 F or 185 C.
Mix warm wet ingredients from saucepan into dry in the mixer and combine for at least a minute on medium speed. Put in greased 8×8 square pan greased with pam. Bake for 20 minutes, then watch carefully to take out before it gets dry. Center of cake should just spring back when touched lightly. When cake is done and cooling melt butter in small saucepan and add cola and cocoa powder. When liquefied slowly pour in powdered sugar until fully combined with wire whisk. Glaze warm cake, Glaze should melt into cake and drip down the sides. In an effort to reduce my belly fat, I decided to munch on some raw endive rather than the cookies in the pantry and realized that on its own it was a combination of bitter and bland. Not even the satisfaction of a crunchy sweet carrot or tasty celery stick for close to the same calories. Endive on its own makes you feel like “this must be good for me because its a raw veggie”, but a raw lettuce leaf is better. It’s somehow gained the status of a gourmet appetizer salad ingredient. It’s strong little boat-like shape makes it a ‘stand-up’ option for dipping sauces rather than chips without the loud crunch or flavor of radish, carrot or celery. It’s so low in calories, 4 calories for one whole small endive so its worry free. Endive also makes a great salad base to show off any topping, opposite or complimentary. 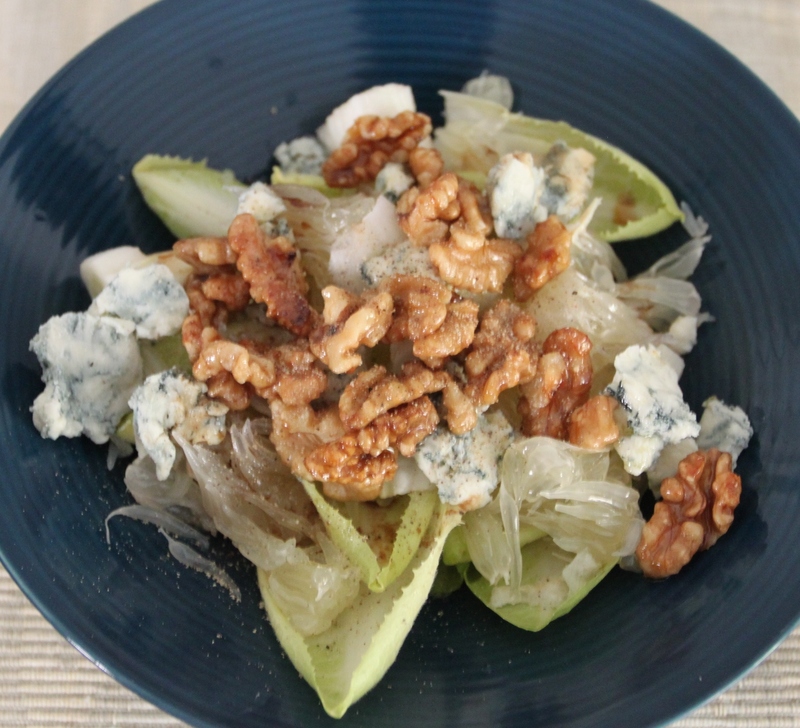 I created a quick endive salad with maple-candied walnuts, pomelo sections, crumbled blue cheese, dressed with lots of pepper and sea salt, splashed with a flavorful virgin olive oil and balsamic vinegar. – simply dress one cup of walnut halves with 1/3 cup of maple sugar and a sprinkling of sea salt in a bowl and heat over a low fire in a small omelet pan until they lightly brown. One of the things that is most lacking in the Middle Eastern cuisine repertoire and availability is Mexican food. There’s only one Mexican restaurant I know of in the country that’s succeeded and that is in broad spectrum Tel Aviv. There’s no decent bottled salsas, enchilada sauce, no cans of refried beans and some of the spices you have to improvise. Limes are only available a couple of short months of the summer, then its back to substituting lemons. Like Chili powder. An American pantry staple just not sold here…quick formula = 2 tsps. ground cumin, 1 tsp. paprika, 1 tsp. cayenne pepper, 1 tsp. oregano, 1 tsp. garlic powder. The thing is here you can reassure yourself its healthier, all you put together is from scratch. I found a recipe on a favorite blog, Will Cook for Friends for enchilada sauce that I adapted for ease and ingredients as well as a chipotle bbq sauce that she inspired and I made my own version. 2. In a measuring cup put tomato paste and add hot water until the volume is 1 1/4 cup. Add honey. Mix. 3. Combine liquid ingredients to sautéing ingredients and simmer a few minutes. Wait until it cools a little and place in a clean jar for storage. This is a layered casserole that starts with red, yellow or orange bell peppers. I like them because the enzymes or whatever is in them is less burpier than the green. Find a few smaller ones and put them under your boiler at the top heat, do both sides. When the skins are just burned and the meat looks softened, put in a bpa free plastic container and let the steam soften the skins more, for 10 minutes. Then peel the skins remove the stems and set aside. They make a great addition to salads or pastas. 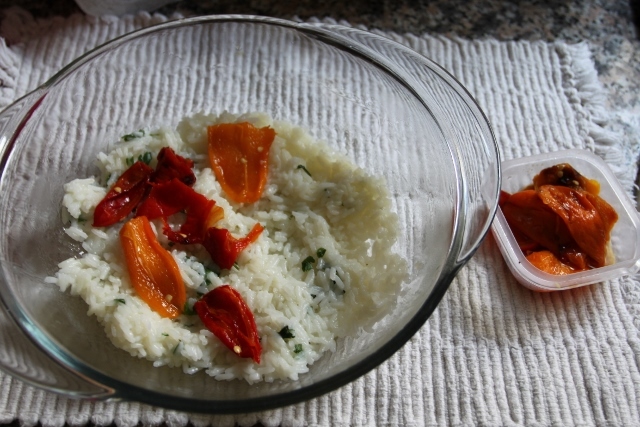 Make one cup of rice and when done add the juice of a lime/lemon and some shredded parsley. Layer some of the rice on the bottom of olive oil rubbed casserole dish. Layer some of the peppers on top of the rice. 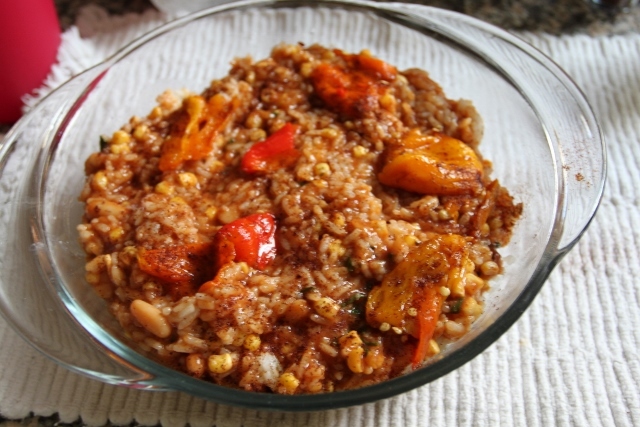 Mix beans, corn, remaining peppers and remaining rice together with half the enchilada sauce. Pour on top of rice layer. 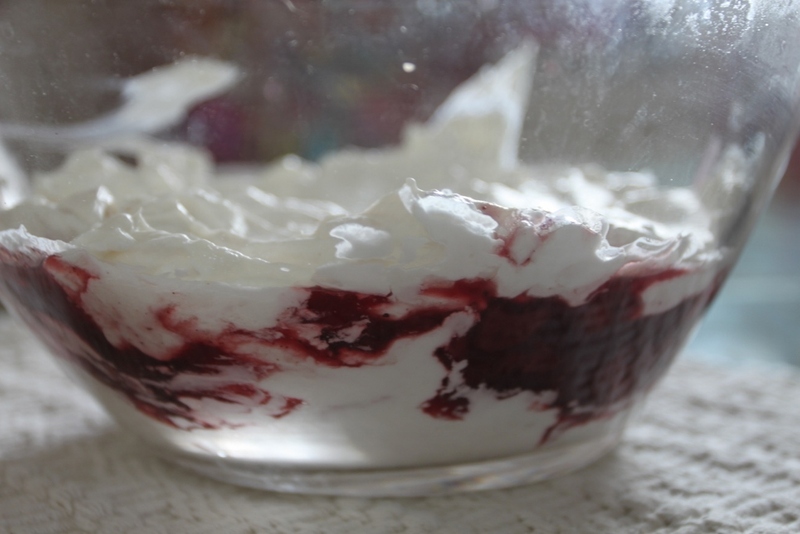 Mix sour cream together with regular cream with a wire whisk in a bowl to get a more liquid saucy consistency. Grate cheddar and Mozzarella together. 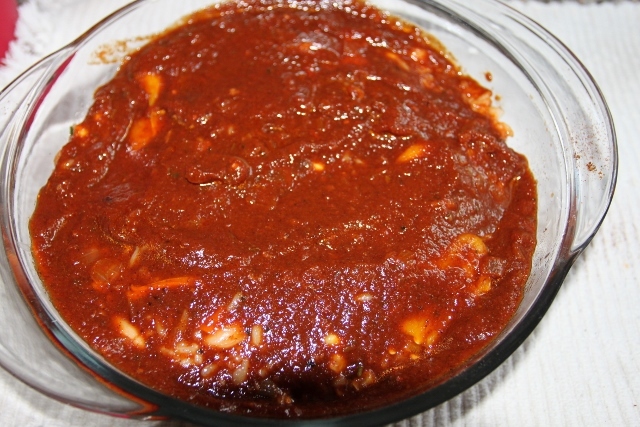 Pour remaining enchilada sauce over casserole. 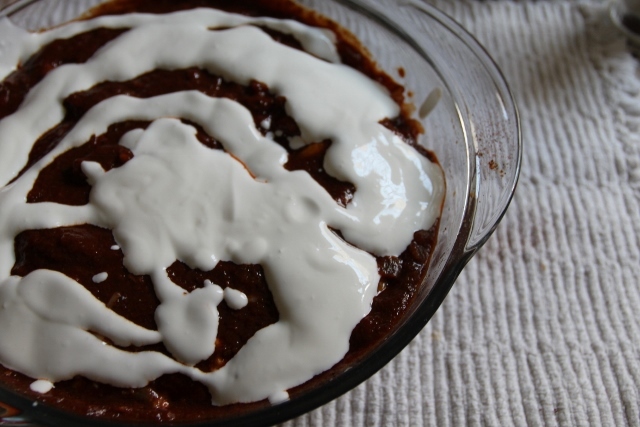 Drizzle sour cream mixture over enchilada sauce. Cover top with grated cheeses. Use a covered dish if possible and put in 185C 350F oven for a half an hour covered so cheese melts. Remove cover for 10-15 so cheese browns slightly, serve. 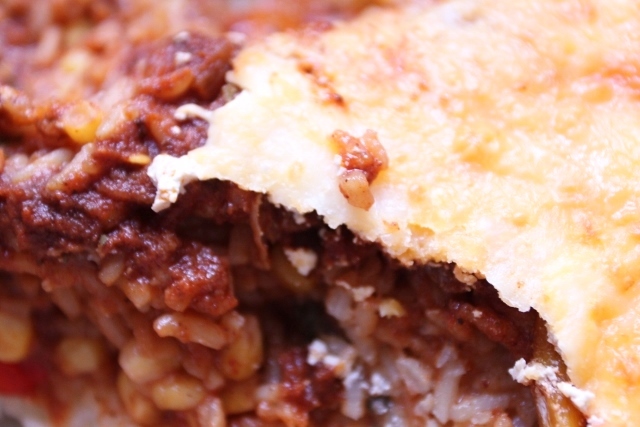 This is a wonderful casserole, an aromatic meat pie that has been such a favorite in my repertoire for guests that I’ve had invitees request it upon invitation. I was even asked to cater a lady’s luncheon of 60 women with this dish. I’ve had many requests for the recipe to which I have always replied, “you don’t want it”. I originally found it in a book and the recipe was four pages long. I’ve streamlined and changed it to make it a little less tedious. Is it worth the time and effort?, absolutely! My streamlined version I think is every bit as good as the old tedious one. You will need a 13×9 baking pan, a pastry brush, a deep covered frying pan or dutch oven a kithen towel suitable for dampening. Thaw out filo dough and take dampened (not soaking) towel and place over dough to keep it from drying out. Melt 1/2 cup butter, you may need more. Spray bottom of baking pan with non-stick vegetable spray. Put filo aside under towel. -Cut onions into strips not rings. Use a good cooking oil like sunflower, not olive (as much as I am a fan of it for everything) as the burn rate is too high. Saute onions in oil on high briefly, then add the peppers and salt. lower to simmer temperature and cover for 10-15 minutes, should cook slowly enough to not burn but moisture from the onions will create a base. -When onions are soft and in their peppery sauce add 1/4 water with turmeric. Place flattened chicken breats on top of the onions and simmer until breasts are cooked through. 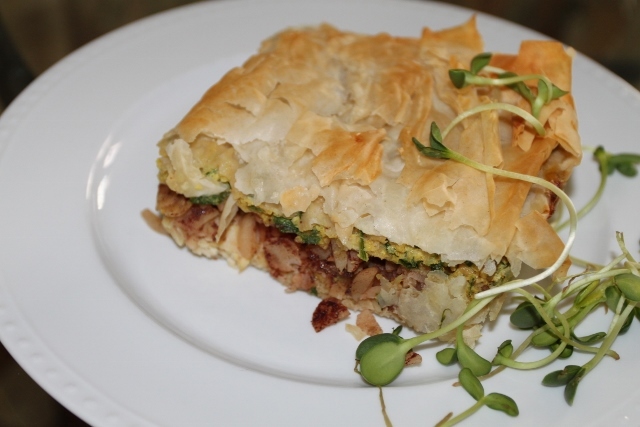 -Take out 8 sheets of filo dough and fit to size pan. Filo can be folded. Of the eight sheets, place two in the bottom of pan at a time and baste with butter with pastry brush. Remove cooked chicken from onions and cut in cubes, leaving onion and sauce to side in same pan. Place diced chicken on top of the filo. Mix in a bowl the sliced almonds with the sugar and cinnamon. Take eight more sheets of filo and repeat process on top of meat layer. Once the top sheet is brushed with butter pour almond and sugar cinnamon mixture over top sheet. Repeat with another 8 sheets of filo in the same manner over the almonds. Put saucy onion mixture back on burner and add parsley until cooked in. Whip the five eggs in a bowls and pour over onion parsley mixture, cook until egg mixture begins to thicken; DON’T let them turn into scrambled eggs, should be a bit soupy. Pour soupy onion egg mixture over last filo layer. You should now have three layers. Take eight more sheets of filo for crust and again every two sheets baste with butter making sure the top two sheets are nicely buttered which will give a brown crisp crust. Cook casserole slowly, 45 min. – hour until cooked through. Filo crust should be crisp and browned. You can make this recipe kosher with the use of margarine instead of butter…butter is better. Nothing says summer like summer drinks, the garden, warm evening breezes. I’ve also had a potted plant balcony garden from where I stared at the view, looking up from a “beach read” book and listening to chill music as the sun takes its time to set. Even in a working summer without a vacation the sunlight and green growth can give vacation moments. We have a few fruit trees in our garden that we didn’t plant, but enjoy their amazing fruit. We don’t spray, just prune and eat the fruit. So we are organic without really trying! 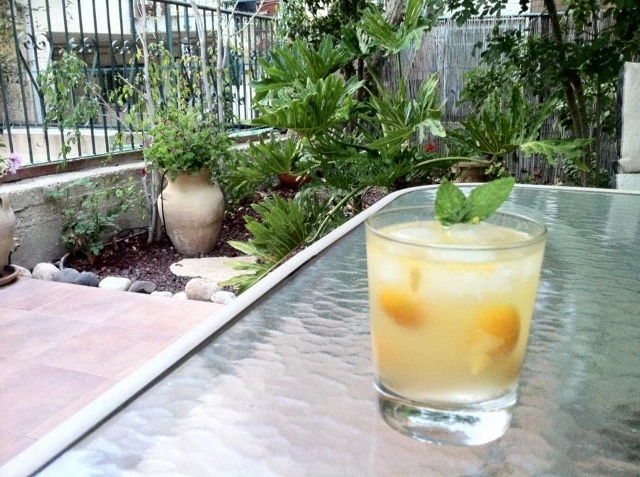 I’m not a big fan of just eating kumquats but our kumquat tree produces a great ingredient for a summer drink. muddle the kumquats with your muddler or pestle to release the juices and break down the fruit. Add vodka in your shaker and shake with ice. Pour into cocktail glass, add soda and stir with cocktail stirrer, decorate with mint leaves.